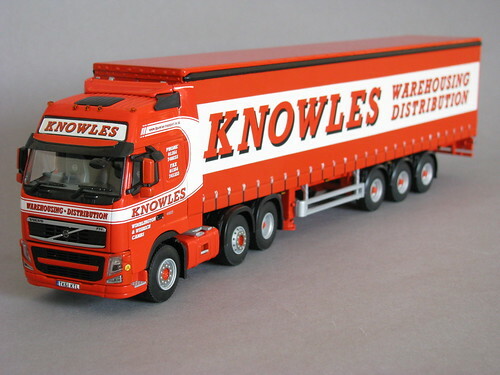 Customised promotional model vehicle specialists, Search Impex, are pleased to announce the release of a 1:50 scale Volvo FH3 Globetrotter XL (6×2) with 3 axle, curtain trailer, customised in the well known livery of East Anglia based operator Knowles Transport Ltd. The model has been produced exclusively for Search Impex by WSI Collectables as a certificated, Limited Edition (105 pieces). 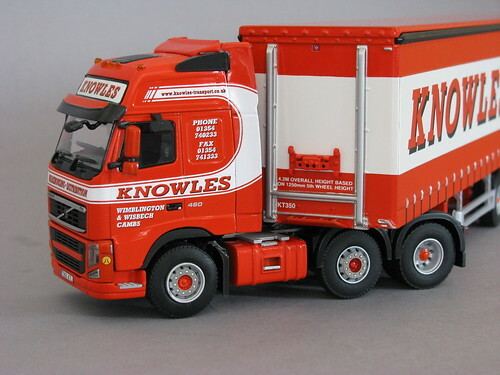 Founded in 1932 by Gerald Knowles, the haulage operation began life with the transporting of agricultural produce to the wholesale London markets (Covent Garden, in particular) and the carrying of sugar beet from the fields of East Anglia to the local refineries. Some 80 years on, whilst general haulage remains the backbone of the operation, the Company has grown unrecognisably. With a fleet approaching 90 trucks and 200 trailers, the business remains privately owned and serves an impressive customer base which includes many household brands from both UK blue chip companies, as well as multi-national FMCG (Fast Moving Consumer Goods) customers. The Company operates throughout the UK and delivers to retail locations, dedicated distribution warehouses and manufacturing plants alike. Hand in hand with its distribution service, Knowles Transport also operates 1.5 million square feet of warehousing within East Anglia, in easy reach of Felixstowe and Tilbury ports, with a huge variety of storage options. Models, available from Search Impex, are priced at £137 each (including UK delivery & VAT). To check availability of this and other models, collectors can visit the Search Impex website at www.search-impex.co.uk or call them on 01332 873 555. This entry was posted in Models, Volvo by truckbloguk. Bookmark the permalink.